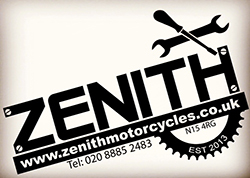 Zenith Motorcycles has been established for over 5 years. We are a busy, successful multi award winning independent workshop in the heart of North London and are looking for a technician / workshop manager to join our team. We have a high standing within the London motorcycle community for quality, honestly and reliability and are looking for someone to grow with us. We are a very unique and diverse business in that we value a team approach to every aspect of the business and although the workshop is busy, we like to keep our work environment as relaxed and friendly as we possibly can. We are looking for not just a technician but someone who can think outside of the box and would like to work within a growing company where colleagues and management work together in constantly improving the service we provide to our customers. Mot qualified desirable but not essential. Experience with main brands such as Honda, Kawasaki, Suzuki, Yamaha & Piaggio is essential. Able to work as a team & supervise turnover of work. Manage a small team of technicians. Have excellent customer service & communication skills as we have a very high standard of customer service. High standard of cleanliness and tidiness. Salary £22,800 per year, 28 days holidays & pension. Apply with CV & cover letter to zenithmotorcycles@gmail.com.